If you were ever going to approach Davey Lopes with a question about something, be ready. Actually, there are a couple reasons for the heightened level of alertness, the first one has to do with Lopes himself. See, Davey Lopes isn’t at the ballpark to hang out and shoot the breeze, so if he deems what you are asking him idle chatter or small talk, he wants nothing to do with it. He might even size you up to see if you are going to waste his time and then he’ll act accordingly. But if what you have to offer is something Lopes thinks is an interesting topic, get ready because he’ll fill up your notebook and/or recorder. Lopes loves baseball and he enjoys talking about it in-depth just as much. That makes sense figuring that he has given his life to the game, first as a great player (mostly) for the Dodgers and then as a coach and a manager for the Milwaukee Brewers. Lopes’ passion for the game has an intensity that even the most ardent of the baseball lifers do not possess. “Black Friday,” for those who were not around for the 1977 NLCS between the Dodgers and the Phillies, or for those historically challenged on baseball lore, remembers the game as the one where the Phillies missed their best chance to get to the World Series to date. If you thought watching the Phillies lose to the Giants in the 2010 NLCS was difficult, the ’77 NLCS would cause lesser souls to swear off baseball forever. Indeed, it was that difficult to see unfold. The game in question was where Greg Luzinski famously misplayed a fly ball against the wall at the Vet during a stage in the game where he had been subbed out in favor of the better defender, Jerry Martin. It’s kind of like the Philadelphia version of Bill Buckner in that a move that is made in most circumstances was ignored for some inexplicable reason. For instance, manager Danny Ozark put Martin in for Luzinski the way Red Sox manager John McNamara replaced Buckner for Dave Stapleton. Only when he decided not to make the routine move for whatever reason is exactly the time everything will go wrong. But that’s not all there was to “Black Friday.” It is also the game where shortstop Larry Bowa made that terrific play to make a throw to first in attempt to nail Lopes on a ball that caromed off third baseman Mike Schmidt. Only first-base ump Bruce Froemming called Lopes safe at first, which paved the way for more miscues as the Phillies blew a two-run lead with two outs in the ninth. It also opened the door for Lopes and the Dodgers to knock the Phillies out of the playoffs and march on to the World Series and a date with the Yankees. 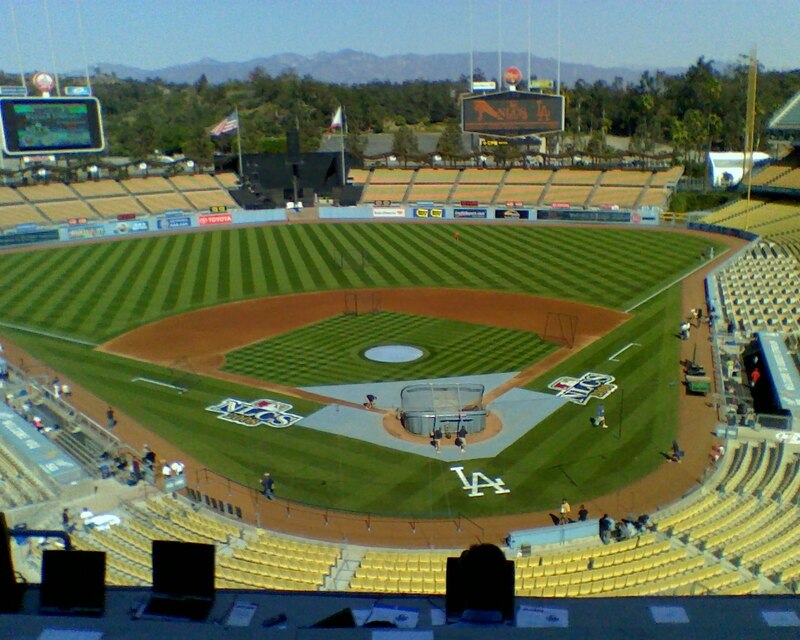 Nevertheless, when Bowa returned with the Dodgers for the 2008 NLCS—the team’s first meeting in the playoffs since the 1978 NLCS—both protagonists, then on different sides, were marched into the interview room for a formal chat. This is where the normally prickly Bowa played the part of the nice guy in reliving a memorable moment in Phillies’ history. “They were good series,” Bowa said, clad in his Dodger uniform and that traditional “LA” cap, during the media conference. “We grew up playing them in the Coast League—they were in Spokane and we were in Eugene, Oregon. We had a rivalry going then. They seemed to get the best of us in those games. “We always made a mistake late. It cost us, but they’re very competitive. You remember when Burt Hooton was pitching and the crowd got into it, he couldn’t throw a strike. Then the rain game with Tommy John. The play in left field where Bull (Greg Luzinski) was still in the game and Jerry Martin had been replacing him and he wasn’t in and it led to a run. Lopes, dressed in his Phillies home whites, followed Bowa and put an end to the Philly hand-wringing over the never-forgotten defeat. “It was 31 years ago. Quit crying and move on,” Lopes said. Certainly Lopes had a fantastic seat for a lot of great moments in baseball history. He was, of course, at second base the night Hank Aaron hit home run No.715 to break Babe Ruth’s all-time record and was the first person to reach out and shake the hand of the new home run king. Actually, it was a prideful moment for Lopes, who as a man with Cape Verdean descent, was often caught in between two worlds growing up in Providence, R.I. Lopes is not African-American, but is a person of color coming from a small island off the western coast of Africa. As such, he took even more pride in playing the same position for the same team that Jackie Robinson and Junior Gilliam once played. Howard Bryant, in his new biography about Hank Aaron, recounts a conversation he had with Lopes about why he shook Aaron’s hand after the historic homer. It was never as easy as just focusing on baseball, either. Lopes missed time at the beginning of the 2008 season after undergoing surgery for prostate cancer that was discovered during a preseason, routine physical. Then, in April, three days before the Phillies’ season opener in 2010, Lopes’ brother, Michael, died in a house fire in Rhode Island. He says those events did not figure into his decision to turn down an offer from the Phillies, though. Baseball, after all, is Lopes' life. He just turns 66 in May and doesn't plan on giving up baseball just because the Phillies didn't make him a proper offer. Lopes played in the World Series in 1974, 1977 and 1978 before finally winning it all in 1981. Later he got to the playoffs with the Cubs as a teammate with Bowa in 1984 and again with the Astros in 1986 where he was teammates with Larry Andersen and Charley Kerfeld. It was in the ’77 World Series where Lopes stood at second base when Reggie Jackson belted three homers in Game 6 to tie Babe Ruth’s record and clinch the Yankees’ victory. 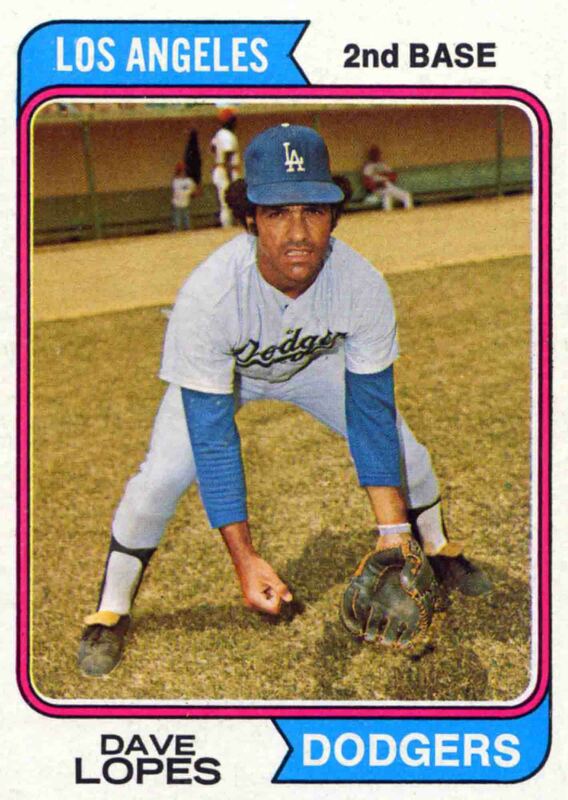 In 1978, Lopes hit three homers, including two in the Game 1 victory, before the Dodgers fell again to the Yanks. Finally, Lopes and the famous Dodgers’ infield of Steve Garvey, Bill Russell and Ron Cey, beat the Yankees in 1981. Lopes contributed to the Dodgers’ World Series victory with four stolen bases against the Yanks, which was his forte. Better yet, stealing bases and teaching others how to steal bases will be Lopes’ legacy. In 16 seasons in the majors, Lopes swiped 557 bases and led the league twice. In 1975 Lopes set the record with 38 straight successful stolen bases and led the league with 77 steals. In 1985 when Lopes was 40 he stole 47 bases and followed that up with 25 when he was 41. Not even Rickey Henderson stole as many bases as Lopes at that age. Then again, Lopes had a knack for doing things at an older age than most. He made his major league debut when he was 27 and after his 34th birthday he was as good as any second baseman ever to play aside from Joe Morgan, Eddie Collins or Napoleon Lajoie. But it wasn’t so much about the amount of stolen bases Lopes racked up as it was his ability to steal bases and not get caught. When he swiped 77 bags in ’75 he was caught just 12 times and that number dipped to 10 times caught in ’76 when he got 63 stolen bases. When Lopes stole 47 when he was 40, he got caught just four times. Lopes’ 83 percent success rate dwarfs that of Henderson (81 percent) and Lou Brock (75 percent). Ty Cobb’s stolen base rate is incomplete, but even from what information that is available, Lopes is better than him, too. So with Lopes coaching at first base with a stop watch in his right hand and his eagle eyes watching every move, spasm and twinge by the pitcher, it’s no wonder that the Phillies led the league in stolen base percentage in four straight seasons. In fact, the 87.9 percent rate the team posted in 2007 is still a big-league record. Want to get Davey talking? Ask him about statistics and stolen bases. Though the art of the stolen base is not popular in some sabermetric neighborhoods, Lopes says stealing bases is the best bet in baseball. Besides, Lopes said, stealing a base is less of a risk than sending a hitter to the plate. Even the worst base stealers are a better bet than the best hitters, he says. When he came aboard after the 2006 season, Charlie Manuel pretty much turned the running game over to Lopes keeping only the power to put up a stop sign whenever he wanted. Nevertheless, Lopes’ base-running theories pretty much took over unabated and with such an important aspect of the game resting in his hands, Lopes used it to make things happen. Too late appears to be the issue between Lopes and the Phillies, too. Lopes told CSNPhilly.com’s Jim Salisbury that he wanted to come back for a fifth season with the team, but negotiations fell apart. Lopes says he wasn’t asking for a lot of money, just more than the regular first-base coach who isn’t entrusted with so much responsibility to the team’s success. Perhaps general manager Ruben Amaro Jr. and the Phils’ brass didn’t value those talents too much? “We just had a difference of opinion on what I felt my worth was,” Lopes told Salisbury. “That’s all. It was a really tough decision because I loved my time in Philadelphia, I loved working for Charlie Manuel, and I have the utmost respect for everyone in that organization. Though the announcement came on Monday, a report surfaced out of Los Angeles that the Dodgers could attempt to woo back their old All-Star. Just think of the ways a guy like Lopes could transform the talents of a player like Matt Kemp. Just think what he did for players like Shane Victorino, Jimmy Rollins and Jayson Werth. Hell, big slugger Ryan Howard even swiped eight bases in 2009 and went from just one attempt to 15 attempts since Lopes’ arrival. If Lopes can make a base stealer out of Ryan Howard, what can’t he do? After Brett Myers threw one behind Manny Ramirez in Game 2, and Russell Martin got plunked by Jamie Moyer and crop dusted by Clay Condrey, Dodgers’ pitcher Hiroki Kuroda fired one over Shane Victorino’s head. Gee, wonder what he was trying to do there? After the purpose pitch, Victorino rightly gestured at Kuroda to drill him on the body if he’s going to do that crap and not up near his head. The conversation continued after Victorino grounded out to first base. Again, he told the pitcher to hit him instead of playing that head hunting bit. Fine. All over, right? Message sent and received. As the benches spilled out onto the foul territory, Manny Ramirez exacerbated the situation by doing that chicken hold-me-back bit. Then Larry Bowa began chirping again and gesturing, which incensed things even more. Yes, imagine that – Bowa stirring it up. Hey Larry, how come Charlie could take these guys to the playoffs and you couldn’t? Go back to coaching third, tough guy. Why can’t Davey Lopes just do the earth a favor and punch Larry Bowa in the mouth? C’mon Davey, I’m sure there are at least a few dozen guys behind you ready to pile on. Anyway, the Phillies went quietly in the fourth. J.A. Happ has settled things down for the pitching, too. After giving up a one-out single to Matt Kemp, Happ retired four hitters in a row until he walked Manny. Happ also walked Martin, which set the table for Nomar Garciaparra’s two-out, RBI single. The Phillies: Pitchers: Joe Blanton, Clay Condrey, Chad Durbin, Brad Lidge, Ryan Madson and Brett Myers Scott Eyre, Cole Hamels, J.A. Happ, Jamie Moyer and J.C. Romero. Infielders: Eric Bruntlett, Greg Dobbs, Pedro Feliz, Ryan Howard, Jimmy Rollins and Chase Utley. Outfielders: Pat Burrell, Geoff Jenkins, Matt Stairs, So Taguchi, Shane Victorino and Jayson Werth. Catchers: Chris Coste and Carlos Ruiz. Catchers: Russell Martin and Danny Ardoin. OK, so is everybody tired of talking and contemplating Manny hitting cleanup for the Dodgers? The face that Ryan Howard and Chase Utley (especially Utley) have not hit with much alacrity during the playoffs? Yep, it’s old. It’s tired. But it’s what we do. No, Davey Lopes wasn’t too keen on talking about the events of three decades ago, but what about the rest of us? Yeah, we know most of the Phillies weren’t even born – or didn’t care – about the Phillies and “Black Friday” and we know that occurrences of last week have no affect on a game today, let alone games played 31 years ago. But here in Philadelphia it’s part of the communal suffering. Why should the Red Sox and Cubs corner the market on the little cottage industry of sports lament? Go sing “Sweet Caroline” or blame a Billy Goat for another loss or something. We’re in the playoffs over here. This is serious business. So how will it play out? Yeah, good question. In that regard I guess I’m with everyone else in that the Dodgers and Phillies are incredibly evenly matched. It’s just uncanny. In fact, if the Dodgers looked in the mirror the reflection looking back at them would be the Phillies. Both clubs pitch well – the bullpens and starting corps are equally solid. They both use speed well and have decent hitters that roll off the bench. For the Dodgers guys like Nomar Garciaparra are the go-to, late-inning bat. For the Phillies it’s Greg Dobbs. Tactically, Joe Torre and Charlie Manuel square off, but in the playoffs most managers will make all moves by the book anyway. If it comes to playoff acumen, though, Torre has the edge. The Phillies have the advantage with the power hitters – that is if they get it going. During the NLDS the Phils won two games with the long ball and they have been scoring runs with homers all season long. Sure, the Dodgers piled up the runs in the NLDS against the Cubs with their new-look lineup, but come on… it’s going to come down to the pitching and defense. In that regard the difference could be how well the Dodgers’ right-handed heavy pitching staff performs against the Phillies’ power-hitting lefties. That means the series will come down to Utley and Howard. That’s where the Phillies are pinning their hopes. "You look at Chase Utley, you think him getting four hits every day, but that don't work that way," Manuel said. "Baseball is 162, get in the playoffs how many games is it. So therefore that's the way you look at it. "We're getting back to that even keel. That up and down. Like guys they don't hit every day. Human nature plays a big part of the game. It's hard to sit and explain to someone how you feel and like what's going on and like with you and all that, and that's the mental part, and also that's the part we have to work through and that's the part where guys on some nights they can go four for four, they have hot and cold nights and they have hot and cold weeks. Sometimes they have a cold month. "Sometimes they have a season cold. But at the same time, I mean, that's the way the game goes." Utley and Howard. There it is… Phillies in 7. Hey, hey folks. Took a few days off as most have noticed. Truth is, it wasn’t by design. I really wanted to gather my thoughts and write down all the stuff I saw in Milwaukee regarding this ballclub and all the things we can expect for the upcoming series against the Dodgers, but, you know, I got a little busy. So yeah, it’s an exciting time to be a fan, writer, player and whatever else of the Philadelphia Phillies. Who knows, they might even win the whole thing? Why not? Teams have won the World Series by accident… at least teams have gotten there through no fault of its own. Take the ’07 Rockies, for instance. Or the ’06 Cardinals and the ’03 Marlins. Talk about accidents. 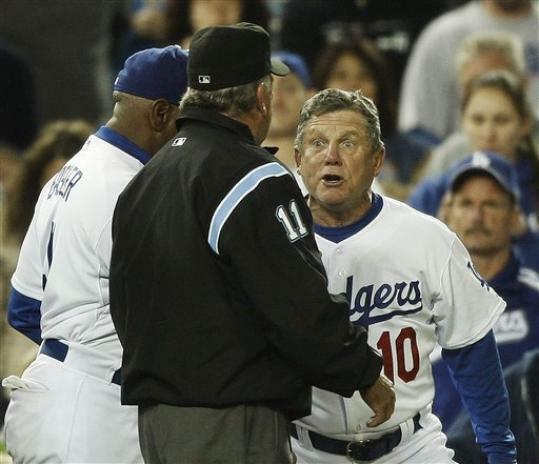 Speaking of accidents, Larry Bowa is back in town with his Los Angeles Dodgers on Wednesday afternoon. Certainly no one ever thought that Bowa would have been in a playoff game at Citizens Bank Park not in Dodger Blue instead of Phillies. What a life that guy leads, huh? After getting the axe as manager of the Phillies, Bowa landed on a gig talking about baseball with ESPN and XM Radio, which led to a job as the third-base coach for the New York Yankees and now LA Dodgers. If you are scoring at home that’s the top sports media company on the planet followed by the two most storied baseball franchises ever. Still, it’s not difficult to get the sinking suspicion that all things being equal, Bowa would much rather be in Philadelphia with the Phillies. You can take the Bowa away from the Phillies, but never the Phillies out of Bowa. Here’s a bet: at some point during the FOX telecast of the NLCS there will be a few hard-hitting stories on Bowa and Phils’ first-base coach Davey Lopes and their role in “Black Friday” as well as the Phillies-Dodgers rivalry from the ‘70s and ‘80s. Black Friday, for those who were not around for the 1977 NLCS between the Dodgers and the Phillies, or for those historically challenged on baseball lore, remember the game as the one where the Phillies missed their best chance to get to the World Series. It’s the game where Greg Luzinski famously misplayed a fly ball against the wall at the Vet and where Bowa made that terrific play at shortstop to make a throw to first in attempt to nail Lopes on a ball that caromed off third baseman Mike Schmidt. Only first-base ump Bruce Froemming called Lopes safe at first, which paved the way for more miscues as the Phillies blew a two-run lead with two outs in the ninth. In fact, Bowa talked about it quite a bit about those old days on Wednesday afternoon. “They were good series,” Bowa said, clad in his Dodger uniform and that traditional “LA” cap. “We grew up playing them in the Coast League – they were in Spokane and we were in Eugene, Oregon. We had a rivalry going then. They seemed to get the best of us in those games. “We always made a mistake late. It cost us, but they’re very competitive. You remember when Burt Hooton was pitching and the crowd got into it, he couldn’t throw a strike. Then the rain game with Tommy John. The play in left field where Bull (Greg Luzinski) was still in the game and Jerry Martin had been replacing him and he wasn’t in and it eld to a run. Davey, indeed, says, “Let it go,” and then some. No matter what anyone says about his personality (or lack thereof), Larry Bowa is far and away the most knowledgeable baseball man a guy like me has ever come across. The old salt knows everything there is to know about the game. He might not ever get another managing gig again, but a guy like Joe Torre has no qualms about adding him to a coaching staff. Here’s the thing about those old playoff games from the ‘70s… the current Phillies don’t get it. Chase Utley had no idea what “Black Friday” was until he was told about from one of the scribes. Even after he learned all about it, he still didn’t seem too impressed. Game 1 starter Cole Hamels kind of heard about those classic games, but doesn’t think he or his teammates really care about it that much. “I wasn’t even born,” Hamels said. Besides, Hamels says, the current crop of players would much rather create their own legacy rather than ride the coattails of one that began over three decades ago. Besides, Lopes says they got the call right the first time. “Tell Bowa I was safe,” he said. Let’s go out on a limb here and say Charlie Manuel is on notice. His task for 2007 is to get the Phillies into the playoffs or he can forget about that contract extension for his pact that ends at the end of next year. At least that’s the way it seemed when the Phillies announced that Davey Lopes, Art Howe and Jimy Williams will be the three new coaches on Manuel’s staff. You see, Lopes, Howe and Williams all have managed in the big leagues, and though only one manager in Phillies history has won more games after his first two seasons as skipper than Manuel, some might argue that a couple of those ex-managers have better credentials than their new boss. Williams guided Toronto to the AL East title in 1989 and took the Red Sox to the wild card in 1998, 1999 and had six consecutive second-place finishes with the Red Sox and Astros from 1998 to 2003, earning AL manager of the year in ‘99. Howe went to the playoffs in three straight seasons with the Moneyball Oakland A’s from 2000 to 2002, including back-to-back 100-win seasons in 2001 and 2002. Lopes, the artful base stealer and Phillies nemesis from his playing days with the Dodgers, was the sacrificial lamb for three years with the Milwaukee Brewers. Nevertheless, the Phillies added 2,283 Major League victories to the coaching staff to go with Manuel’s 393. Suddenly, the so-called overmatched Manuel has quite a bit of experience to draw upon in the dugout. “We're going to have a hell of a staff,” he said. Yes, it was a joke, but it wasn’t complimentary either. On the new staff, Williams will be the bench coach and coordinate spring training the way John Vukovich used to. Howe, an infielder with those good Astros teams in the late 1970s and early 1980s, will be the third-base coach and infield instructor. Lopes will be the first-base coach and base running and outfield instructor. Lopes could have a big influence on Jimmy Rollins and Shane Victorino on the base paths. Conversely, if the Phillies struggle out of the gate in 2007, or Manuel, inexplicably, loses the clubhouse, GM Pat Gillick doesn’t have to look far for a replacement manager. In that regard will Charlie be sleeping with one open? Is he going to cast sidelong glances over his shoulder to see what his lieutenants are doing? Nope. At least that’s what he says. “Not at all,” Manuel said. “I feel good about it. These guys are going to be helpful to me and our club. Gillick says – at least publically – that Manuel shouldn’t worry about anything but doing his job. Apparently, as stated previously, Manuel didn’t have that during his first two seasons. “Charlie is the man, and we're going to do everything we can to help him be successful,” said Howe, who has a reputation for being one of the friendliest men in baseball despite the fact that he managed the Mets for two years. For normal folks, that experience is enough to make one turn his back on all of humanity. Not Howe. Now he’s working for Charlie and the Phillies – the loosest and happiest team in the National League. Though it’s not exactly a scoop or a well-kept secret, Gillick says he wants to try to deal Pat Burrell again. Apparently, the club had a deal with Baltimore last July but Burrell invoked his no-trade clause to remain in Philadelphia. Said Gillick: “We're going to have to continue to look for a little more offense. We know that at this point, Pat has had a difficult time protecting [Ryan] Howard. We're going to have to continue to have to make an adjustment in that area. And naturally, we're going to have to continue to improve our pitching. Gillick says the American League champion Tigers have advanced so quickly because of their pitching. But in order to be a legit player in the free-agent market for the highly coveted Alfonso Soriano and Aramis Ramirez, the Phillies will have to figure out what to do with Burrell and the $27 million they owe him for the next two seasons. Musings from the NLCS and a look ahead to this weekend’s Ironman Triathlon in Hawaii and the Chicago Marathon, which unofficially kicks off the Fall marathoning season. Plus, the opening game of the World Series is this Saturday in Detroit.